This week I have a story on The Environment Report. 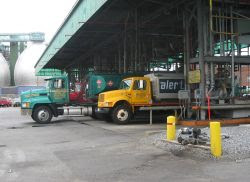 It’s about an oil company in Brooklyn that’s getting into the biodiesel business. Aside from a few spot news reporters I’ve filed for NPR, this is the first radio piece I’ve produced since moving to New York. It was nice being able to drive a short distance to cover something happening in my own backyard. During the year that I was freelancing in Princeton, I never had less than a 30 minute drive to cover a story. Occasionally I’d find myself in the car for 2 or 3 hours. Now I’m toying with the idea of selling my car and signing up for Zipcar. It might make it harder to cover breaking news or to do tape syncs that aren’t available by train. But I could save hundreds if not thousands of dollars on car insurance, gas, and maintenance. Anyway, back to the story. What initially attracted me to this story was the fact that an oil company is getting involved in alternative fuels. It turns out it’s not that Metro Fuel Oil expects the oil economy to end anytime soon. But they do want to get in on a growing industry — especially while Mayor Michael Bloomberg is proposing a major increase in the amount of alternative fuels government vehicles and buildings will use. In a city the size of New York, if Metro only sold fuel to the government, that’d still be a lot of money. Add to that generous subsidies from the federal and state government, and Metro’s confident enough to build a 110 million gallon facility, which is expected to be one of the largest in the country when it opens next month. a least I hear something nice about biodiesel in NY area. Please, let me know how I contact any staff member of this project.